Why is eyewitness testimony sometimes misleading? How does evolution explain what qualities people seek in online dating partners? These questions and many more are addressed in a convincing, thorough, and funny overview of why we are the way we are. Why do we do the things we do, think the thoughts we think, and feel the ways that we feel? 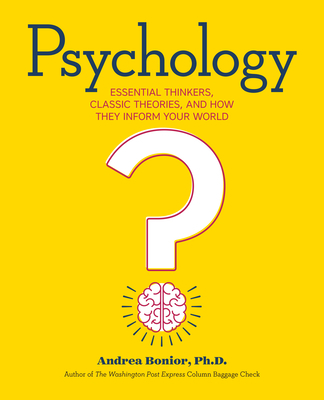 Dr. Andrea Bonior has spent more than fifteen years in the field of psychology helping people discover "what makes them tick?" In her clinical practice, as well as various mental health agencies and counseling centers, she draws upon sound psychological principles to address anxiety disorders and depression, relationship issues, grief and loss, and other issues. As a mental health columnist and public speaker, Dr. Bonior encourages people to fuel their energy by connecting with themselves and cultivating the relationships around them. Psychology bridges the gap between the theoretical and real-life, creating a space where you can explore how you and others fit into it all. Dr. Bonior looks at the biggest names, ideas, and studies in the history of psychology and translates their meaning to everyday situations and relationships. Both accessible and applicable, this reference book offers a foundational understanding of the study of the mind, as well as compelling insight into your own thoughts and behaviors. DR. ANDREA BONIOR is a licensed clinical psychologist, professor, columnist, and author. Thousands of people are familiar with her column -Baggage Check, - which she has written for The Washington Post Express for more than ten years. She's a frequent contributor to various popular media outlets, such as NPR, Forbes, The New York Times, HLN, CNN.com, MSNBC.com, Jezebel.com, U.S. News and World Report, Real Simple, Cosmopolitan, USA Today, Everyday with Rachael Ray, Glamour, Self, Good Housekeeping, Woman's Day, and Seventeen. Dr. Bonior received her B.A. in psychology from Yale University and completed her M.A. and Ph.D. in clinical psychology at American University, with post-doctoral work at George Washington University. She maintains a clinical practice, and serves on the faculty of Georgetown University. Find out more at www.drandreabonior.com/.